The Dino-Lite Edge AM5216T is a simple yet professional D-sub microscope designed to observe objects within its 20X to 220X magnifying capability. Based on the Edge series improved optics, this model is designed to deliver stunning image sharpness through a supporting 720p resolutions screen at 60fps. The MicroTouch button on the AM5216T is configured to quickly freeze video frames with a single tap of a finger, or to control on/off the LEDs. The scroll lock on the magnification dial is able to secure the dial and fix the focus and magnification, which can be helpful to prevent unintentional rotations of the dial in some applications. 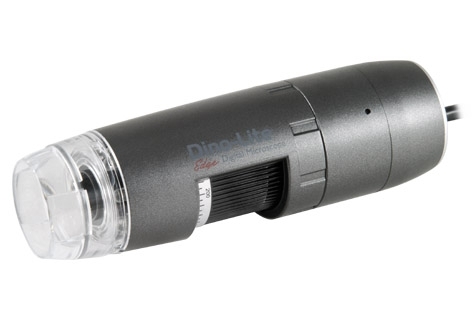 For the Dino-Lite Edge series microscopes, there are interchangeable front caps available to suit different purposes. The current available options are close cap, open cap, diffuser cap, extended cap, long cap, and sidelight cap. The AM5216T does not require a computer or bundled software to operate, but instead functions through a VGA monitor connected via the D-sub interface. Thanks to the simplicity of system configuration and minimized maintenance requirement, the largely reduced overall system and operating cost together with the high image quality makes it ideal for use beyond industrial application.